8 of our club just returned from the Assynt region. Lochs fished were Borralan, Cam, Veyatie, Mhondail, Urigill and Shin. Two of the guys wasted some time trying for salmon on a bare boned R Oykell. All Lochs produced plenty of fish and some members just lost count after 30 or so. The weather was excellent. Mostly sunny with a good breeze and some light cloud cover. Lots of various types of sedge about. A few mayfly on Cam and prolific hatches on Urigill on Friday. Some of the guys who had not been there before thought they had landed in Heaven. Highlights for me personally was catching fish on Shin after blanking on my last visit there 40 years ago. Also getting my boat on to Veyatie that enabled me to fish Loch Mhadail. The Lochs were quite low and getting across the sand bar from Veyatie into Mhondail was impossible with an estate boat. Nearly all fish were caught on dry flies and top rod was Dave the Dap with his dapping rod. He also had the best average sized fish with several around the pound mark. Another, younger member, went to the other extreme and tried for Ferrox on Veyatie with a toby resulting is a 2 1/2 pounder and lots of other fish. Hope he grows out of it for the next rip. Nice work Terry. Any photos? Living with deep, full breaths is the way of the trout. Fish, it seems, are the ultimate teachers in breathing. Unfortunately not Euan. Neither me or Dave the Dap (my usual boat partner) are media inclined. Pity really because we were in Gods country, catching spotted beauties. I have never dapped before but D the D's results were quite convincing, so I set up a dapping rig on a 10' rod and pointed it to the sky at arms length. Bingo! Trouble was after missing more fish I instinctively tried to re cast, resulting in a wet flaccid pile. Had to give up with and aching arm after a while. I am sold on dapping in the right conditions though. When comparing notes with a fellow fisherman who I have met up there a couple of times before, it turned out that he had been bank fishing on Assynt that day and had caught 4 finnock and a 4lb grilse! Must try that next trip. Get a proper dapping rod outfit as it is well worth it. My new dapping rod arrived today. A Mitchell 17'. £35 + postage from GAC. Looks good quality for the price but I question the small size of the top 3 rings. I assumed that the rings would need to be quite large so that the the floss would flow out easily? Use monofilament no lighter than 20lbs but no heavier than 30lbs for the 'running line', you need a balance between lightness and control. Your 'leader' on the front of the floss should be no more than 2ft. Is dapping floss readily available guys? www.flylineshop.com At the heart of your fishing ..... lies a great fly line! It is Mike, although quality varies, the best I used was spinnaker dapping floss which was very robust. Mike - maybe you could stock the best quality available? ......as long as it's pink! Hamish - I had trouble handling and seeing the mono and considered using yellow or orange 20lb backing line by Leeda. It seems very light and smooth. The mono I'm using is technically a running line for shooting heads (so handling is relatively easy) and it's super-vibrant pink in colour (so easy to see). Let me know how you get on with that rod Terry, I've not tried that one but in the main most modern telescopic rods sold as dapping rods have been far too stiff for the task at hand IMHO. 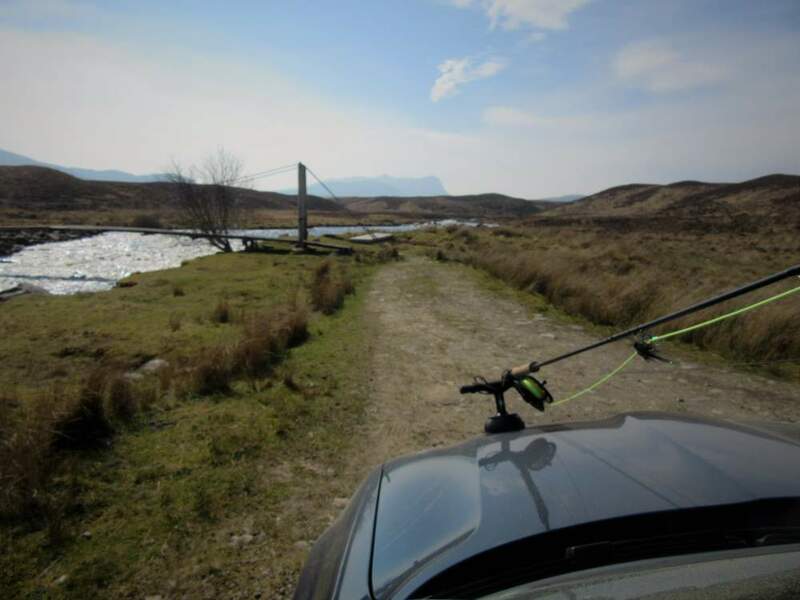 I have read some interesting posts on the forum about dapping – most recently from the Assynt anglers. It is a brilliant and exciting way of fishing. However, there seems to be a dearth of books and advice on the method. I started fishing on the colliery flashes and canals of industrial Lancashire over sixty years ago. I have done every kind of fishing and practised dapping for trout on wild Scottish lochs. I am by no means an expert but am proven successful in this style. Based on my own experience, I offer some ideas, for what they are worth, to those who want to become serious dappers. Forget telescopic rods. They are clumsy, heavy and prone to collapse with the noise of somebody with noisy loose dentures! Throw' em away. If you are a serious dapper spend some money and have a rod made. My rod is a three piece fifteen feet made on a Harrison blank. It is the perfect length, light, easy to wield, and gives good sport with small and larger specimens. (I have no commercial connection with any companies). Best reel is a 4.5 or 5 inch basic centrepin with a strong click pawl which will allow the fish to hook itself. Lines: this is a no brainer. Without doubt, one hundred yards of 20 pound breaking strain Airflo braided mono fly line backing is the best: the type used for making braided leader loops. There are other brands on Ebay. I use white which is easy to see. This line is light, hollow, visible and does not kink or tangle and is easy to handle. Because of its light hollow structure it performs like a dapping line. The top Irish dappers say that in strong winds the braided mono will suffice although I have yet to try this. Hence, a five to seven feet length of dapping floss is all that is required for presentation. Glasgow Angling Centre (Megastore) sell floss. I use a superglued needle knot to make a permanent loop on the end of the braid. And a loop at the top of the floss to enable a loop to loop connection. I tie an overhand knot about every foot or so of the floss followed by a overhand loop knot at the bottom of the floss to connect the cast. I use about four feet of nylon monofilament tied loop to loop for the cast. I lke 8 pound breaking strain: it is fine but strong and gives confidence in every situation. Experimentation will soon allow you to devise your own preferred formula for dapping. Do not get precious about flies. Big and bushy is the rule. The Kingsmill Moore Claret Bumble tied large is my favourite killer; but experiment between dark and light colours. Daddy longlegs is a favourite with many dappers. It is amazing how fish will come up from nowhere, often when least expected and no fish are rising. Always take your wet fly rod with you. Misses or lack of takes on the dap will often lead to results on the wet fly and vice versa. If fishing with a partner, one dap and one fish the wet fly and alternate methods. Purchase or tie dapping flies but when the going gets tough in calmer conditions a scaled down standard loch bushy top dropper or dry fly like a sedge or Wulff will often work. Fish will usually take the fly violently with a savage take or slap the fly down and take sub-surface. Occasionally, the take will be a gentle sip and smaller fish will even jump out of the water to grab a fly hovering over the surface. Fish hook themselves but you will also miss a few; or, more likely, the fish misses the fly. Good luck and make sure you take your heart pills in preparation for those sudden takes. Great stuff Stuart. Since that trip to Assynt I have been doing a lot of 'long rod' boat fishing. The shortest rod being a 15 footer. The longest rod 'concoction' has been 18'6". I have not been happy with telescopic rods (tried 4 inc a home made one). I will have more to say about this next week. Forget telescopic rods. They are clumsy, heavy and prone to collapse with the noise of somebody with noisy loose dentures! Throw' em away. This represents the only thing which I strongly disagree with in an otherwise interesting post Stuart; it would be unwise to dismiss the idea of a telescopic rod. Whilst I do agree that far too many telescopic rods that have been 're-purposed' from other types of fishing are indeed clumsy and heavy that is far from the truth of them all. The key thing is to find the right telescopic rod for dapping with, way back in the late '80s early '90s I had a wonderful rod of about 18' that was both well balanced and the perfect tool for trout, sea trout and the occasional salmon on Lochs including my home water Loch Shiel. That had an unfortunate accident and ended up a lot shorter than the manufacturer intended - even when fully extended..... I never quite managed to find a something that was quite right after that until a few years ago when I was put onto the idea of 'bolognese' style rods. Perfect, highly recommended. But I do agree that it makes sense to avoid most things being sold as dapping rods in shops.... unless you already know what you're looking for. Personally I find having a non-telescopic dapping rod something of a ball-ache when out and about for a day afloat - but one man's meat is another man's poison.